When you’re looking to give faded or aged fabric a new lease of life, you need the service for carpet cleaning Welwyn is talking about! Delivered to you by the hands of experienced and fully trained professionals, this service makes keeping your expensive rugs and carpets healthy and well maintained, easy. The web server used by Cleanerwelwyn.co.uk is run by Dedicated Server Hosting and located in Great Britain. This web server runs a few other websites, mostly in the english language. 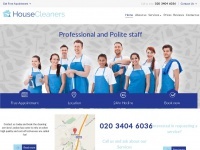 The websites of Cleanerwelwyn.co.uk are served by a Nginx server. The content management system WordPress is used. The HTML pages were created with the latest standard HTML 5. Due to the robot information on the webpage, the following actions by webcrawlers are not allowed: using the description of the website from the Open Directory project. All other actions by webcrawlers are allowed.